Although bracken out-competes and swamps most plants, it seems to allow sporadic Foxglove plants, especially on south-facing lowland hillsides. Could a symbiosis be at work here, or is it just that Foxglove grasps the opportunity to grow quickly while the bracken is still in the crozier stage? 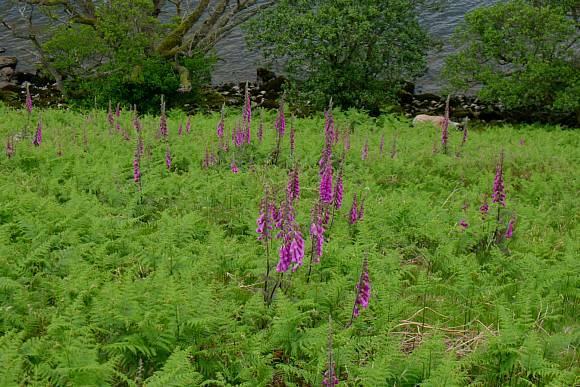 Could the high potash content of dead bracken help fertilise the fast growth of Foxglove? Bracken is the only fern that has side branches. 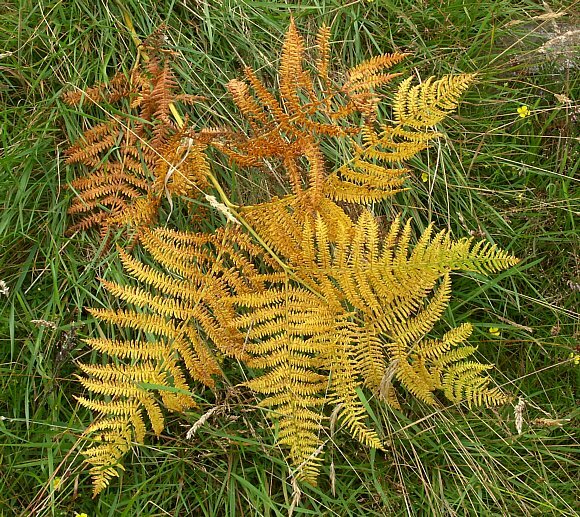 In late summer bracken starts to turn first a beautiful golden colour and then then brown. It doesn't completely die back, but will remain over-winter in this dead stage. The stems will then be hollow but woody, sharp enough to break skin if stabbed by a broken stalk. In spring new growth springs from where the old dead brown stuff remains from last year. New growth has a single un-branched stem, with short un-branched fronds coming off the stem at intervals. The top is curled up; the fiddle-head, and gradually un-rolls as it grows. The crozier stage - fiddle-heads un-curling. Spreading across the fells, but failing to colonize the rocky summits. 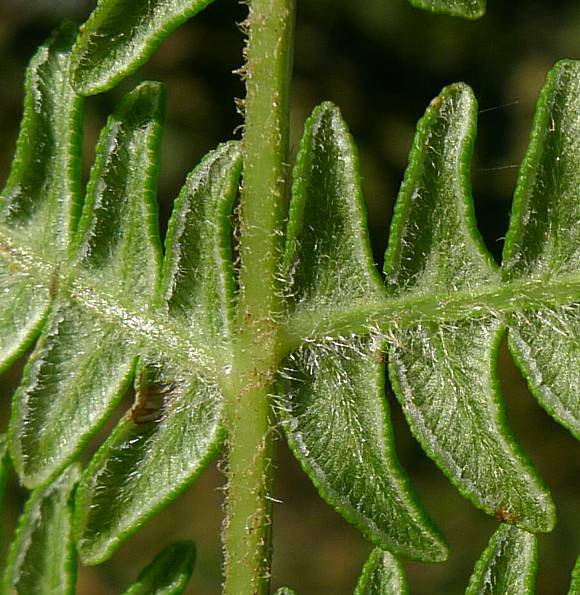 The branched structure is the main identifying feature of Bracken. A mature frond, triply pinnate, sometimes there are tetra-pinnate sections. Only the lowest pair of pinnae are tri-pinnate, the rest bi-pinnate. The individual pinnules and pinnulets are curled backwards. The leaves and stiff grooved stem. Leaflets shiny on upper surface, bright green, and with rounded terminations. Most leaflets are opposite each other, but not always. There is a faint herringbone-pattern of raised bumps. Under-surface light green with whitish hairs. Stems sometimes square-ish. In the process of turning from double pinnate to triply pinnate. No spores present, it only spores about once a decade (although your Author is not sure whether this applies just to individual specimens, colonies, or to the whole country-full of Bracken). At last, after years of looking, Anthony has found some bracken with spores. 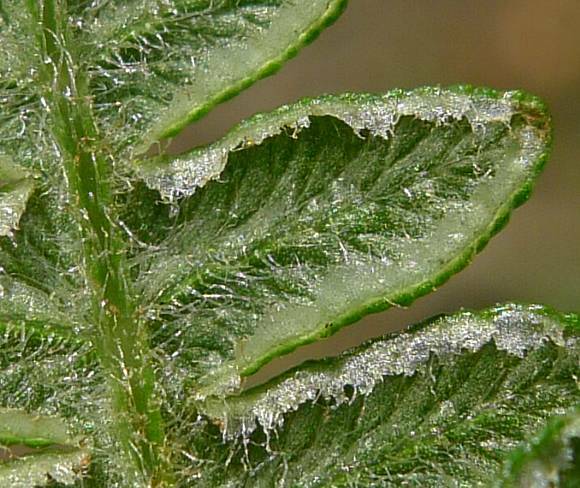 The spores occur in a thin strip on the curled-over edge of the underside of the leaves. Most spore strips avoid the extreme tips of the leaflets. 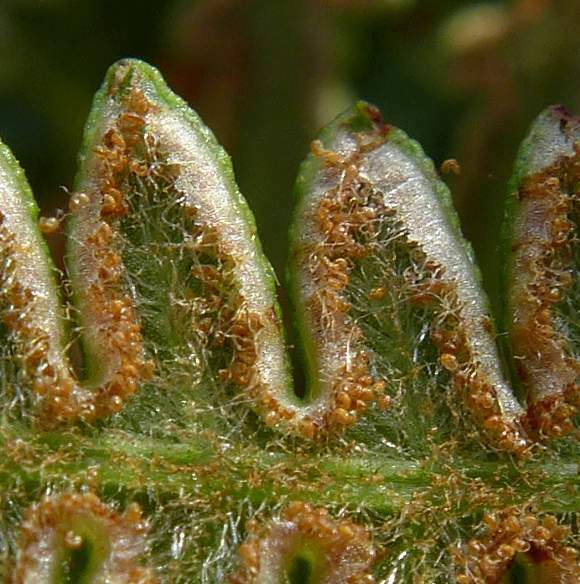 Close-up of spores on the edges of the leaves, which have white hairs. At last your Author has also found bracken with the very elusive spores. 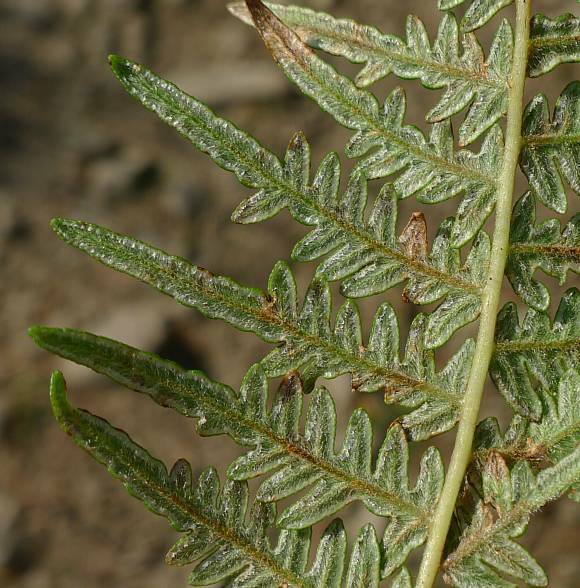 And it is indeed in the same year (2014) as Anthony Skillern independently found some growing on bracken near Macclesfield, several dozens of miles apart. Distinguishing Feature : the only branched fern. 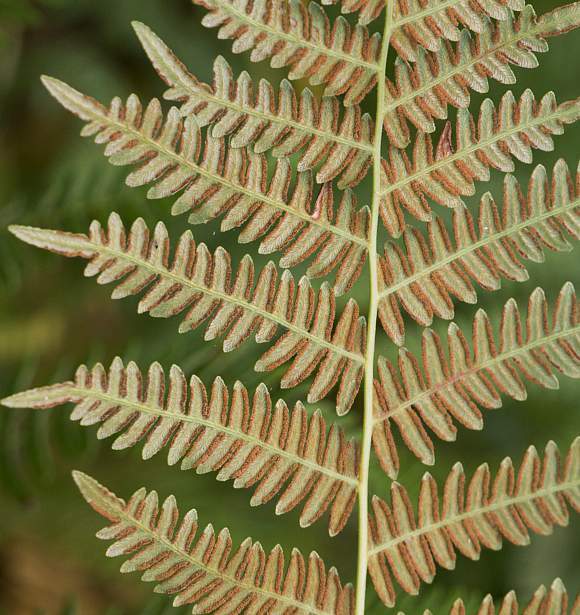 Apart from the fronds at the very top which are 2-pinnate, all fronds are at least 3-pinnate, some 4-pinnate. The only other possibility is that it may be Pinewood Bracken (Pteridium aquilinum ssp. latiusculum) (previously called Pteridium aquilinum ssp. pinetorum), a rare [RRR] sub-species which grows in pinewoods in the Cairngorms. 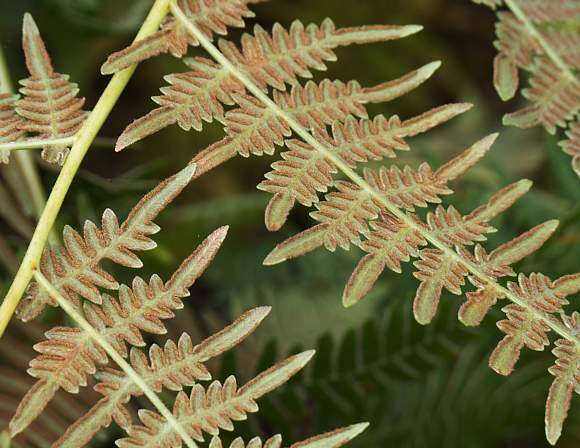 Bracken is mostly a plant that likes acidic soil, and avoids alkaline soils, but is not un-known on them. It grows at heights up to about 590m on free-draining soils in sunny positions. 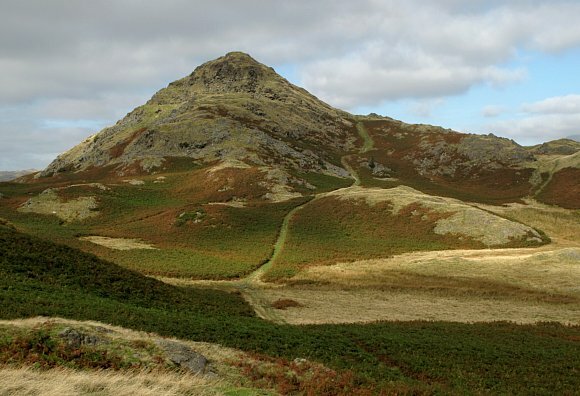 It thus covers the sides of many Lakeland (and many other) Fells. The new shoots with curled fronds first appear in May, but are still vulnerable to late frosts at this early stage. It reproduces either through the numerous spores, which are carcinogenic, or vegetatively by underground rhizomes. 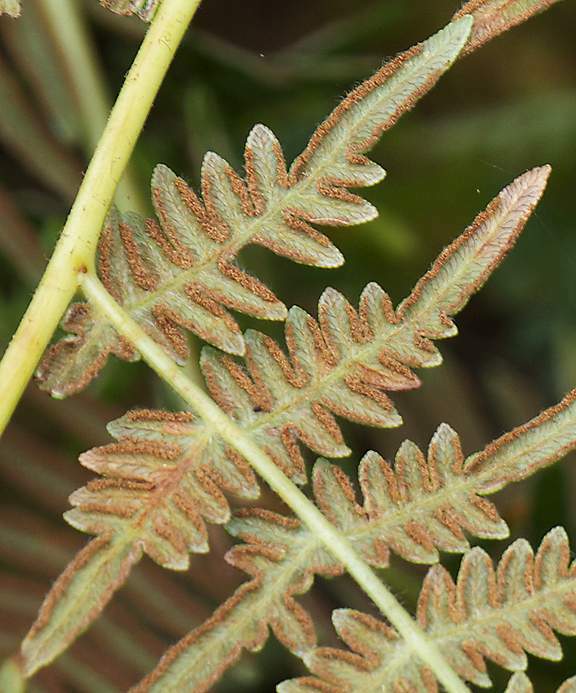 Bracken does not spore every year, only sporadically approximately every decade, although the trigger for sporing is un-known - it is not seem to be climatically related. It is extremely toxic to horses, cattle and sheep, but they will only eat it when they are extremely hungry. Animal fatalities are known, but wild boar are able to eat it with impunity, this being one method of control (but wild boar are a dangerous species, and mostly this method of control is not an option). Bracken can grow to about 8 feet high, and carpet the moorland so densely as to be almost impenetrable should one not already exist. In this state it maintains a high humidity on hot sunny days, and under these conditions it is more likely to harbour sheep ticks. Many, but not all sheep ticks, carry Lyme Disease, and if they subsequently bite humans may infect them with this debilitating and in-curable (in its later stages) disease. Any ticks should be removed in their entirety as soon as possible (this includes extricating the head, which is buried beneath the surface of the skin); treatment for Lyme Disease is effective provided it is caught within a month of being bitten. This may be wrong - some research suggests sometimes after only 4 hours you can become infected with Lyme Disease. Bracken is a persistent and spreading weed, which will cover vast areas of upland moors if left un-checked by fire or sheep and cattle. Animals will not eat established growth, it is far too un-palatable and poisonous, but they may young shoots. Bracken is clump forming, and digging it up involves great effort for its roots (rhizome) extend quite deep and wide and the root-stock tenacious. And it will re-grow next year anyway. Once established bracken is almost impossible to eradicate unless the area is dug up for several years running. Bracken can be harvested, and is sometimes. But this does little towards eradicating it. The over-wintering undergrowth can become a fire hazard when tinder dry. Over winter the flattened dead bracken insulates any spores from the cold that may be germinating. Bracken only spores after hot dry summers, between late August and October. Because Scotland rarely has prolonged hot summers, it rarely spores in Scotland. Long hot dry summers only occur every 11 years or so (the average period of the sun-spot cycle) and this may well account for the oft quoted 'bracken spores only every 10 years'. The UK may get 2 or more hot dry summers in a row near the sunspot maximum, so if conditions are right, it may spore twice in those ~11 years. But usually only on alternate years (the average temperature is biennial, going up and down on alternate years - something to do with the Southern (ocean) Oscillation. But this alternateness may hiccup when some years have two equally hot or equally cold yearly averages in a row because the Southern Oscillation also hiccups. 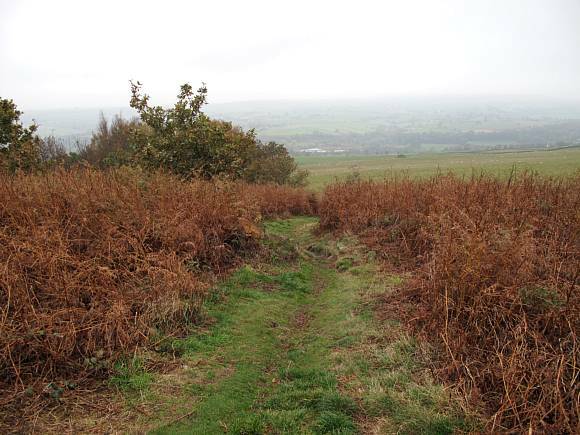 The spores of bracken only travel on the wind during windy dry spells; wet weather inhibits the release of the spores. Only young bracken plants will spore if the weather is right, older plants spread vegetatively by under-ground rhizomes and can do this for years. 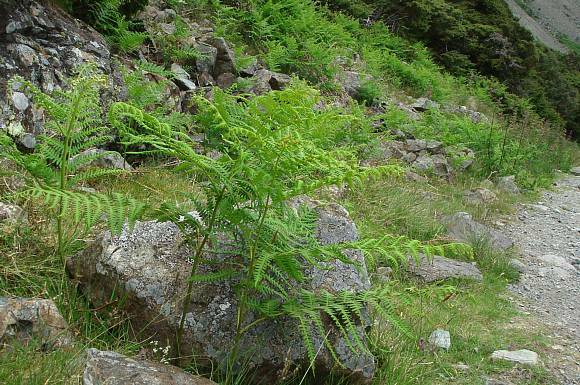 From sporing, it will take 3 years for a young bracken plant to become fully grown. It is capable of growing on uplands up to 600 metres above sea level, but 450 metres maximum is the norm. 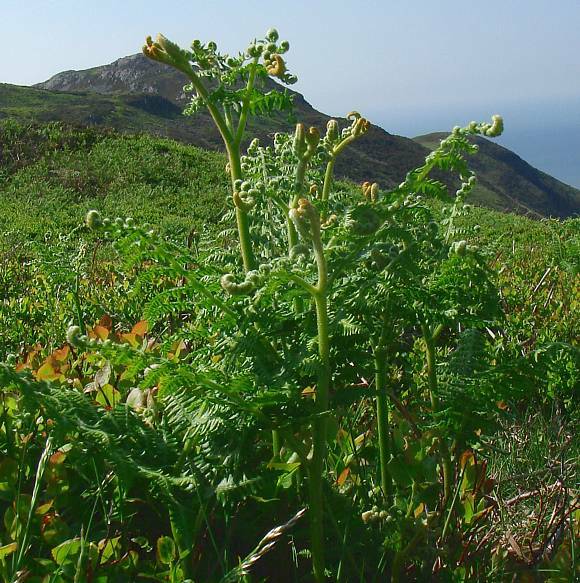 Bracken can also be controlled chemically with the chemically synthesized herbicide Asulam [Sodium N(4-Aminophenyl) sulfonyl carbamate methyl ester] which is highly selective against bracken (and also dock), killing them, but having virtually no effect on any other desirably vegetation. It does, however, require the operator to wear protective clothing, since it is not innocuous to mammals! It is also used as an anti-viral agent. Although Bracken will usually out-compete most other plants, it will and frequently does, happily co-exist with interspersed Foxglove especially on the slopes of Bracken infested upland mountains. Your author speculates that there might be some sort of symbiosis taking place. The microscopic dust-like spores are carcinogenic and are wafted into the air by summer draughts. There are carcinogens, mainly ptaquiloside, within the plant especially the young 'fiddleheads' and the symptoms of acute lethal poisoning by ingestion of bracken is similar to that from exposure to lethal radiation (for example from a highly radioactive substance): bone marrow aplasia, haemorrhage and severe gastro-intestinal damage. Farm animals are most at risk, especially cattle and sheep. The carcinogens are passed on in the milk from cows, and hence possibly to humans. They can also cause progressive retinal degeneration. The rhizomes are free of ptaquiloside. The concentration of ptaquilosides seems greatest in the Spring, when the young croziers are emerging into fiddleheads. 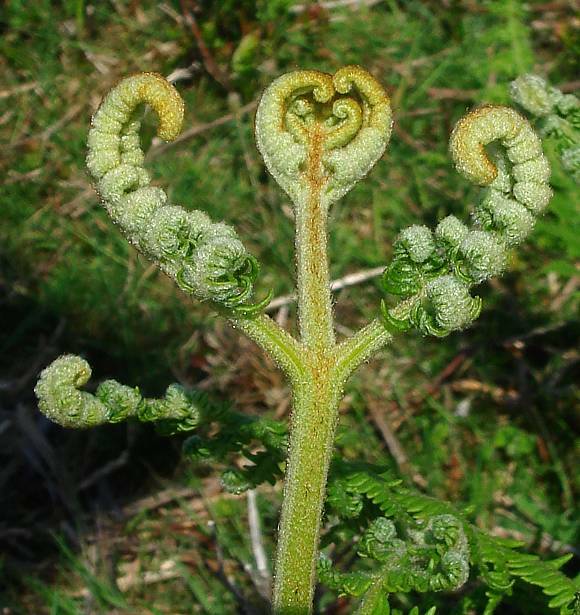 Different animals react in varying ways to the poisons in Bracken; horses get 'Bracken Staggers' which appears 1-2 months after consumption of the plant, and is characterised by muscle twitching, staggering, heart arrhythmia, loss of appetite, convulsions and ultimately death. Pigs, however, suffer loss of appetite, vomiting, heavy breathing and then sudden death, whereas cattle and sheep are only affected after consuming considerable quantities, although they do not get Thiamine deficiency because they manufacture Vitamin B within their rumen. Cattle, however, do develop haemorrhagic bracken poisoning, with blood in urine, faeces and bloody discharges from nose, eyes and mouth. Sheep are especially vulnerable, as they eat it more often than other animals, who often find it un-palatable unless there is nothing else to eat. Sheep may in addition suffer permanent blindness where the eyes become bright and clear due to permanent retinal degeneration, this being known as 'Brights Disease' or 'Bright Blindness'. 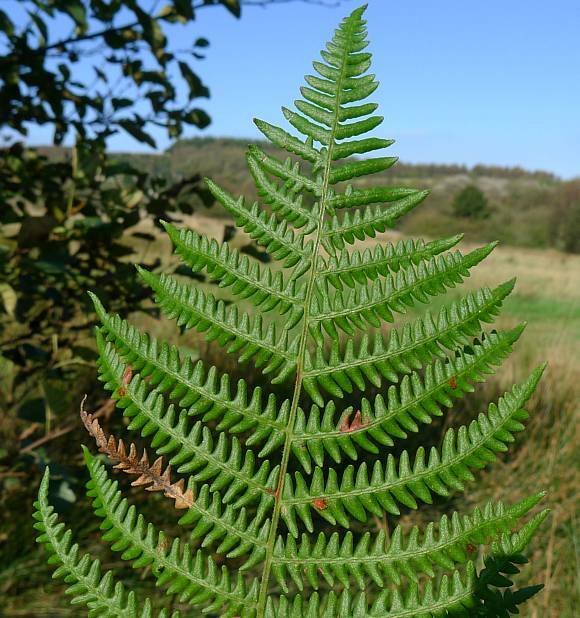 The toxins within (all parts) of bracken destroy the rods and cones within the retina, and their corresponding neurons making the sheep blind and quite un-able to see, yet the eye remains clear and 'bright' - they are not cloudy with glaucoma. In addition, strong carcinogenic activity is observed in many animals that have either eaten it or been exposed to bracken spores. Both blood platelet count and white blood cell count is low. People are advised not to walk through bracken when it is sporing, although since it spores only every 10 years or so in late summer, this is no great hardship. But beware catching Lyme disease from ticks (see above). The ash from burned Bracken is alkaline, containing potash, and has been used in glass-making and in the manufacture of soap. Because of its high potash content it is also useful as a fertiliser. Bracken contains Thiaminase , as do some Horsetails. 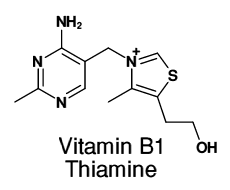 Thiaminase, if ingested, destroys Thiamine (aka Vitamin B1), a sulfur atom containing compound not produced in the human body but which is nevertheless essential in helping to break down carbohydrates into glucose. 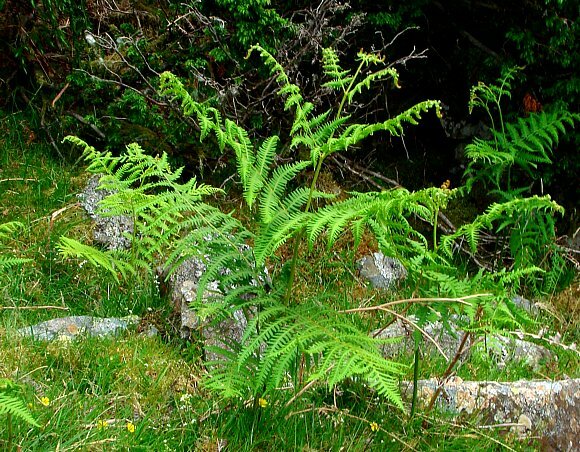 Clinical signs of bracken poisoning resemble Vitamin B deficiency, otherwise known as beri-beri. Symptoms of vitamin B1 deficiency in beri-beri sufferers are severe lethargy and fatigue, nervousness, depression, loss of appetite, muscular weakness, tachycardia and arrhythmia as well as plumbing system complications. Death is a possibility. Thiamine (aka Aneurin ) is Vitamin B1. Like all vitamins, the body cannot synthesize Thiamine itself and yet requires it, so it has to be provided by the foodstuffs humans eat. [Only Thiamine is shown, which Bracken does not contain; Thiaminase itself is a very large and complicated enzymatic molecule beyond the scope here to depict]. Ptaquiloside, a nor-sesquiterpene with a D-glucose sugar unit attached, is the carcinogenic agent in Bracken. It has a spiro-cyclo-propane unit (shown in red) and it seems to be this that is responsible for the carcinogenicity: it readily opens up and breaks DNA chains most readily wherever the sequence occurs in the DNA, resulting in DNA cleavage. The young shoots of Bracken have been eaten as a vegetable in Japan resulting in a high incidence of bladder cancer. 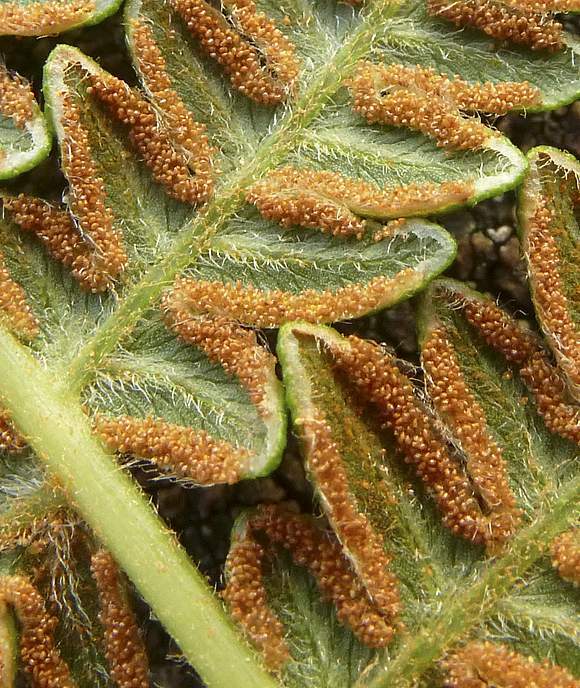 Ptaquiloside also occurs in a number of other ferns, many of which are foreign to the UK, except Ribbon Fern . If Bracken is consumed by cows, the Ptaquiloside is passed on in the cows' milk. 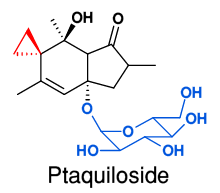 [Ptaquiloside seems to be totally synonymous with Aquiloside A ; there seems to be no discernible difference between the two chemical structures. (Not so for Aquiloside B, C, D, etc)]. As well as containing ptaquiloside, other illudane type-B glucosides have been found in bracken, namely Isoptaquiloside and Caudatoside . Ptaquiloside possesses a spiro-cyclo-propane unit (shown in red) which readily opens up and breaks DNA chains most readily wherever the sequence occurs in the DNA, resulting in DNA cleavage. Ptaquiloside is unstable under both acidic and basic conditions, and readily hydrolyses with water to produce first Ptaquilosin (losing the sugar unit), then a number of Pterosins. And yet it is not the Pterosins which cause the damage to cells, it is the proximity of DNA to Ptaquilosin which can precipitate the decomposition of Ptaquilosin forming a DNA Adduct via intermediary compounds not shown instead of Pterosin B. The DNA Adduct then goes on to synthesize the wrong proteins, causing havoc in the cell. 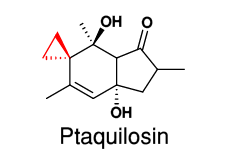 Thus Ptaquiloside is both mutagenic and carcinogenic, and is ultimately responsible for most of the carnage wreaked upon a mammal by consumption of Bracken. But not all. There are other poisons and carcinogens present, Kaempferol amongst them. It has not been proven that Ptaquiloside is the carcinogen in the spores, which are also carcinogenic. 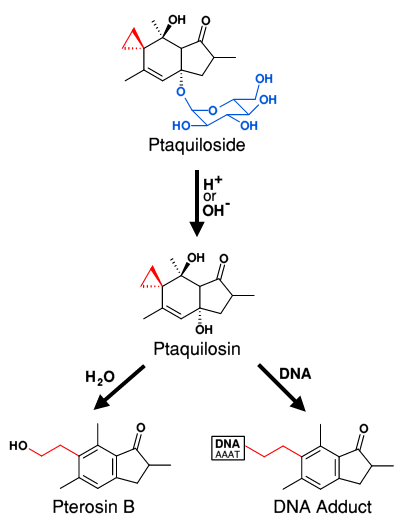 Rather than ptaquiloside (and other chemicals that plants produce that interfere with DNA/RNA) being a means by which to poison external enemies of plants, might not these be utilised in some way by the plant itself to control or influence some aspect of its own development? Although it may seem a little like putting a 'spanner in a gearbox' sort of mechanism, could this be just what the plant needs in certain circumstances, for instance when the plant is damaged? When a leaf, or a branch needs to fall off? Or perhaps much more subtle and purposeful changes, like the anther splits into two at this juncture? After all, all plants are different in non-subtle ways. These DNA disruptive chemicals might be just the ticket the plant needs to co-ordinate different aspects of itself. This cannot be a universal mechanism utilised by all plants; not all plants produce ptaquiloside for a start, but a lot of plants do produce other carcinogenic chemicals. Carcinogens usually act upon DNA/RNA mechanisms. Could many plants have invented diverse methods for controlling some aspect of themselves? After all, a fern is not a grass. This individualistic nature may explain why such a mechanism has remained obscure; biologists tend to study universal mechanisms rather than exclusive processes. Have we discovered all there is to find out about what makes all species, genera and families different? Your Author will leave the reader to further ponder and speculate upon this matter. He doesn't know the answer. 2011 UPDATE : It has just been discovered that eating Brussel Sprout s causes the alteration of the DNA within the blood. Your Author understands that this is not due to mutation of the DNA - the cutting it up and splicing it together out of order as some carcinogens do - but rather a methylation of some of the genes, which acts to modulate the protein expression of the genes, an altogether more subtle effect. In addition to other pterosins, Bracken contains three chlorine-containing pterosins, Pterosin F (which Chameleon also contains) Pterosin H and Pterosin K, all closely related. The chlorine atom probably makes these compounds more toxic than without it. Bracken contains the related carcinogens Quercetin and Kaempferol, both of which are flavonoids, and in this case, flavonols. They are polyphenolic plant anti-oxidants, also known as Catechins. 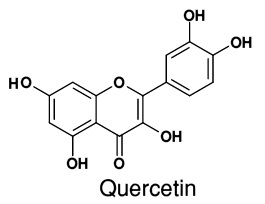 Quercetin is found in a wide variety of plants such citrus fruits and onions. 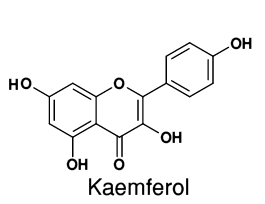 Kaempferol has one less hydroxyl group than Quercetin and is found in Beans, Grapefruit , Brussel Sprout s, Broccoli, Apple s, Witch-Hazel and Delphiniums. Rutin is a diglucoside of Kaempferol, also found in a variety of different plants. Kaempferitrin and Astragalin are other glucosides of Kaempferol. Flavonols are yellow or deep yellow in colour and contribute to the colour of many yellow flowers. Bracken contains the cyanogenic glucoside Prunasin (albeit in this instance in harmless quantities). At much higher concentrations than are contained in Bracken, Prunasin is a dangerously poisonous cyanogenic glucoside which is also present in Black Cherry (aka Rum Cherry Prunus serotina) and in Cherry Laurel (Prunus laurocerasus. Cyanogenic glucosides contain (one or more) glucosides ('sugar' molecules) attached to a cyanide group somehow. Examples of other naturally occurring cyanogenic glucosides are Amygdalin, Dhurrin, Linamarin, Linustatin, Gynocardin, Heterodendrin , Lotaustralin, Sambunigrin, Taxiphyllin and Unamarin . After ingestion, the cyanogenic glucoside is acted upon by hydrolysing enzymes (which are themselves liberated from the plant cells after ingestion), releasing first the sugar molecule (and in the case of Prunasin) leaving Mandelonitrile. Mandelonitrile is further acted upon by the hydrolysing enzymes releasing Benzaldehyde and Hydrogen Cyanide. Similar mechanisms are at work for the other cyanogenic glucosides; the end result always being that hydrogen cyanide is released. It is the hydrogen cyanide which is the poisonous fraction; that preferentially binds to haemoglobin in the blood preventing oxygen from binding. The consequence, if sufficient is consumed, is death by lack of oxygen (asphyxiation). Thus the plant needs to contain both the cyanogenic glucoside as well as the hydrolysing enzyme to be poisonous, if it contains just the latter, it is none poisonous. There are many other Cyanogenic glycosides based upon differing chemical substrates, but all share the ability to lose the cyanide group upon the action of enzymes, which may or may not be present in the same plant from which the cyanogenic glycosides derives. For a list, consult the chemical index . 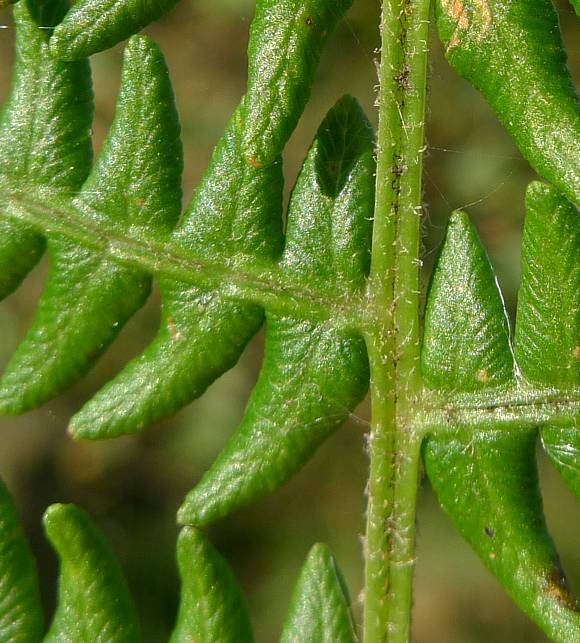 The highest amounts of Prunasin in Bracken (which are found mainly in the fronds and spores) occurs in the spring-time when it is growing fastest (whilst it is in the crozier stage). A great many plants contain Cyanogenic glucosides, including Cassava (tapioca), and many plants belonging to the Rose Family, Pea Family, Spurge Family, Carrot Family and the Grasses etc. Sea Arrow-grass contains the cyanogenic glucoside Taxiphyllin, Elder contains the Cyanogenic glucoside Sambunigrin, which is the (S-)-enantiomer of Prunasin. The cyanogenic glucosides themselves are synthesized within the plants from various amino acids, and are there to protect the plant from herbivores. It is possible that valuable anti-cancer drugs may be derived from the many and varied cyanogenic glucosides by engineering the delivery system to target cancer cells, thus delivering the HCN directly to the cancerous cells rather than poisoning haemoglobin. 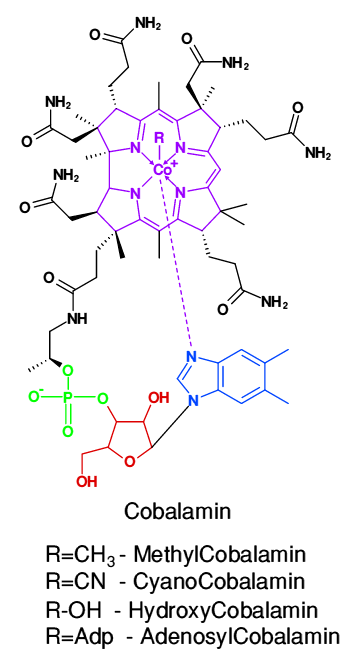 The above shows Cobalamin with the active complex shown in purple, which has 3 coordinate bonds (show with arrows) plus a radical shown as 'R' which is covalently bonded to the central cobalt atom and which is responsible for most of the entities characteristics. With the 'R' replaced by a moiety, either cyanide - CN, methyl - CH3, Hydroxyl - OH or Adenosyl - Adp, differing compounds of Cobalamin can be formed. The rest of the molecule consists of a Phosphate ion (in green), a Ribose glycoside shown in red, several amides (of 2 sorts, ethylamide and propylamide) which adorn the complex (in black) plus a dimethyl-benzimidazol (in blue). Only the HydroxyCobalim occurs in plants as the natural Vitamin 12, the others, especially CyanoCobalamin are man-made synthetic Vitamin 12 equivalents (they behave similarly within the human body). The medical treatment for cyanide poisoning involves treatment with Vitamin B12, a complex molecule containing Cobalamin Cobalamin contains an atom of cobalt at its centre co-ordinately bonded to 5 nitrogen atoms plus a radical, R, which can change. In Vitamin B12 itself this radical is an -CH3 group, and Vitamin B12 is called MethylCobalamin . Both Cyanogenin Glycosides and Glucosinolates contain a -CN moiety which, when consumed, is capable replacing the oxygen attached to haemoglobin by the cyanide -CN moiety, which has a greater affinity for haemoglobin than does oxygen, and it rapidly replaces the oxygen molecule with the cyanide moiety, thereby depriving the unfortunate Cyanide-poisoned victim of much-needed oxygen; the poisoned victim may die of asphyxiation (lack of oxygen). The treatment for cyanide poisoning involves not MethylCobalamin, but HydroxyCobalamin, where the -CH3 moiety on Cobalamin is replaced by the -OH moiety. The Cobalt atom in HydroxyCobalamin has an even greater affinity for that -CN moiety now on the haemoglobin molecule and snatches it from the haemoglobin at the same time relinquishing its grasp on the -OH moiety, forming CyanoCobalamin instead. This allows oxygen to once more circulate in the blood of the victim attached to haemoglobin, saving him from probable death. Vitamin B12, aka MethylCobalamin, is also produced by some bacteria, playing an important role in the environment. But MethylCobalamin can also bio-methylate some heavy metals by the catalytic powers of the co-ordinately-bonding cobalt atom it contains. Heavy metals such as Mercury to produce the highly toxic MethylMercury Hg+CH3 which is produced in the sea and other aquatic systems such as rivers, streams, ponds, wetlands, soils and sediments by the action of MethylCobalamin on a source of metallic mercury, such as volcanoes, weathering of mercury-containing rocks and from human sources such as broken thermometers and disposed mercury-containing products. MethylCobalamin is also necessary in the human body for the synthesis of Methionine from HomoCysteine , an amino acid. Methionine is important in the methylation of genes which helps inhibit cancer, prolongs life, and is essential for human development. Some other Cyanogenic Glycosides liberate a third molecule besides hydrogen cyanide, such as Acetone or Methyl Ethyl Ketone (aka MEK ). See Cultivated Flax.